Let's face it - Python is pretty awesome, and what better way to make use of that awesomeness than to incorporate it into your projects? 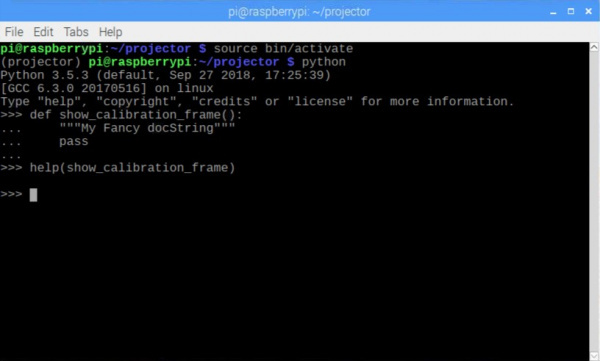 Here we're looking at some of the methods and libraries involved with projecting images using computer vision and Python. Since I’m finishing this tutorial around the holidays, it seems appropriate to create a Santa hat projector! Hopefully once you've completed the tutorial, you'll be able to substitute in whatever item you want for your own uses. To establish an acceptance criteria, I’ll consider this project finished when someone can walk in front of the projector and have the computer track them, projecting a Santa hat on their head. We’ll start with a fresh install of Raspbian however you’d like to install it. There are lots of tutorials on how to do this, so I won’t go into it here (check out our tutorial). Once the operating system is installed, we need to make sure that everything is up to date. This can take quite a while, depending on how out of date the software image you started with was. The next part of computer vision is, well... the vision part. We’ll need to make sure that the PiCamera module is installed correctly. 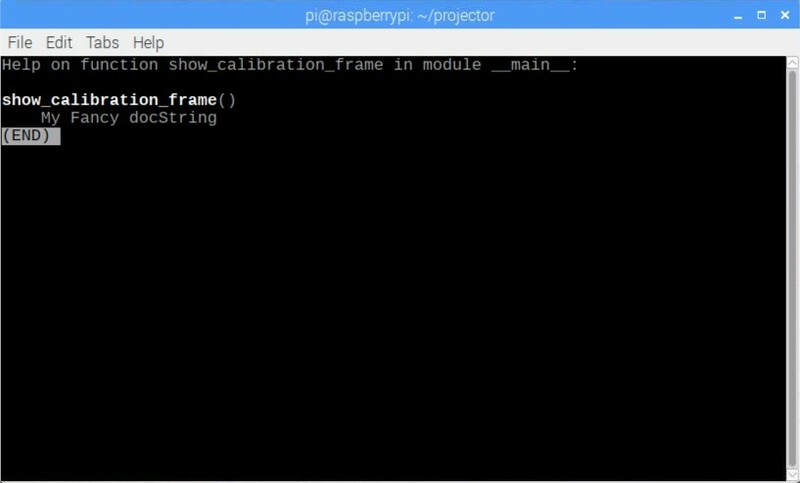 Start by making sure your Raspberry Pi is off, then open up the PiCamera module, and install it by inserting the cable into the Raspberry Pi. The camera connector is the one between the HDMI and Ethernet ports, and you’ll need to lift the connector clip before you can insert the cable. Install the cable with the silver contacts facing the HDMI port. ⚡ Please note! The camera can be damaged by static electricity. Please be sure to ground yourself before touching any of the sensitive parts! 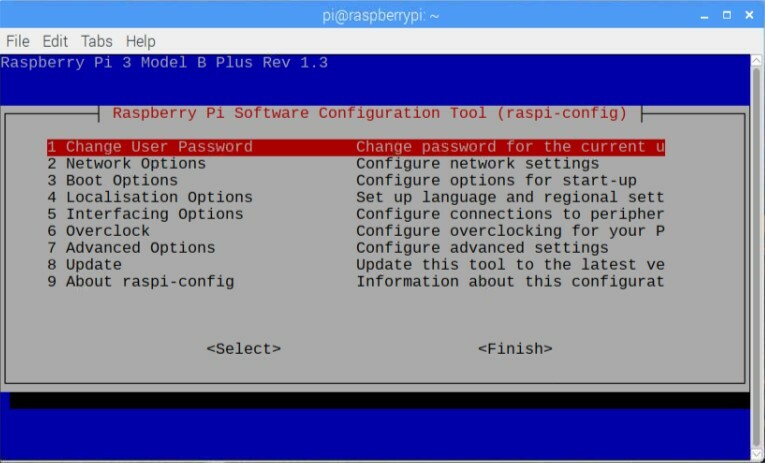 After you have the module physically installed, you’ll need to power on the Pi. Under the Interfacing Options tab, enable the Camera module. You’ll need to reboot before the changes take effect. If you think you’ll use the features, it can be convenient to enable ssh and VNC while you’re at it. 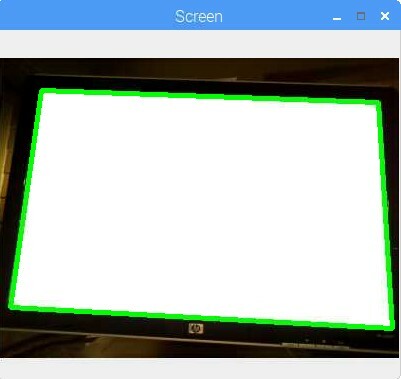 It should be noted that if you use VNC with some of the Pi Camera tutorials, some of the image preview windows don’t show up. If you are connected to a monitor, you’ll see the preview, but just not over the network. I've tried to stay away from those types of previews in this tutorial, but just in case you get some weirdness, it's worth checking with a dedicated monitor. If you have a dedicated monitor connected, you will be given a few seconds of preview before the photo is captured if you'd like to compose your image. I believe this is the only example in the tutorial that falls under my display warning above. Feel free to name the test image whatever you’d like. If everything is set up correctly, you should be able to look at you awesome new test image in all its glory. The easiest way I've found to do this is to open the file manager on the desktop, navigate to your image, and double click it. If you cannot create an image, or the image that is created is blank, double check the installation instructions above to see if there’s anything you may have missed or skipped. And don’t forget to try a reboot. 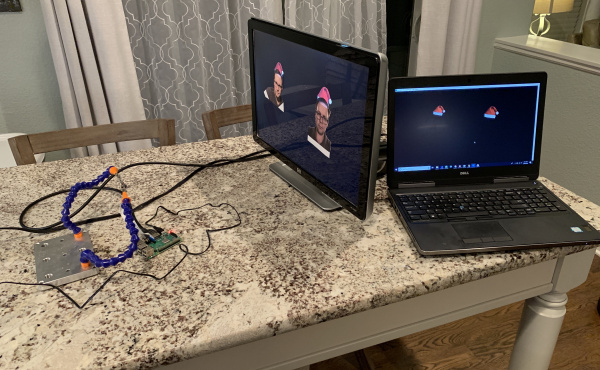 We’ll only be scratching the surface of what openCV can do, so it’s worth looking through the documentation and tutorials on their website. Dlib is a modern C++ toolkit containing machine learning algorithms and tools for creating complex software in C++ to solve real world problems. It is used in both industry and academia in a wide range of domains including robotics, embedded devices, mobile phones, and large high performance computing environments. Dlib's open source licensing allows you to use it in any application, free of charge. You’ll start to notice a pattern here. Computer vision takes a lot of math... and I’m a big fan of using the right tool for the job. Looking at the computer vision libraries that we’ll be using, you can see that both are written in a compiled language (C++ in this case). So you may ask, "Why?” Or even, “How are we using these if they’re not written in Python?” The key points to take away are, while these libraries are written in a different language, they have Python bindings, which allow us to take full advantage of the speed that C++ offers us! I’d highly recommend looking deeper into virtual environments if you haven’t started using them already. Using a virtual environment is not at all a dependency of this project. You will be able to follow along with this tutorial without installing or using a virtualenv. 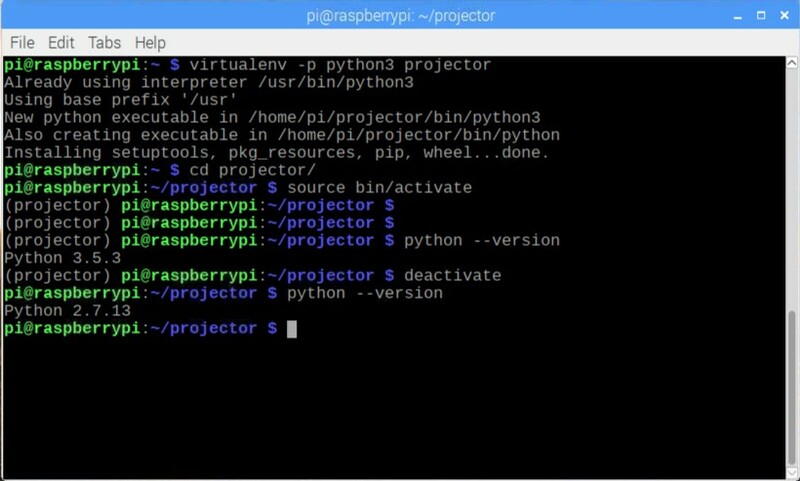 The only difference is that your project dependencies will be installed globally on the Raspberry Pi. If you go the global route, you can skip over the section that details the installation and use of the virtual environment. If you're curious and need installation instructions, check out their documentation here. You can see in the command that we are specifying that when we run the python command while inside our new space, we want to run Python 3, and not what ever the system default is set to. We have also named our project projector because why not? You should see your prompt change once you’ve entered the environment. That’s it! You’ve now created your protected development space that won’t change other things on your system, and won’t be changed by installing new packages, or running updates! A note of clarification. This virtual environment is only for Python packages installed via pip, not apt-get. Packages installed with apt-get, even with the virtual environment activated, will be installed globally. Continuing with our project, we will need to activate our development environment again. 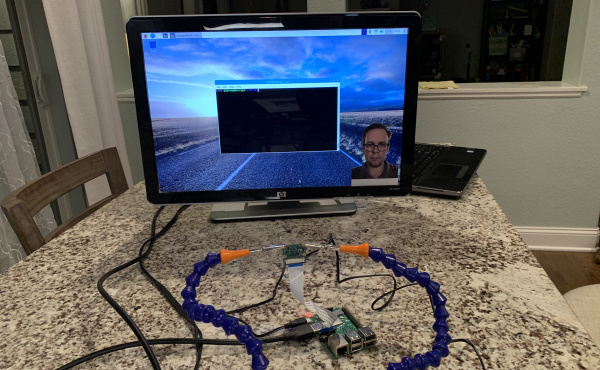 Now to install OpenCV for our project, along with a library for the Pi Camera, and some image utilities. We’re installing pre-built binaries for OpenCV here. These libraries are unofficial, but it’s not something to worry about, it just means they are not endorsed or supported directly by the folks at OpenCV.org. The alternative is to compile OpenCV from source, which is a topic for another tutorial. We can install dlib in the same way. This also has a pre-built binary available for the Raspberry Pi, which again saves us hours of time. Camera calibration is one of those really important steps that shouldn't be overlooked. With the reduction in price of small cameras over the years, we've also seen a significant increase in the amount of distortion their optics introduce. Calibration allows us to gather the camera's intrinsic properties and distortion coefficients so we can correct it. The great thing here is that, as long as our optics or focus don't change, we only have to calibrate the camera once! Another important general note about camera calibration that doesn't apply to our project, but can be very helpful is that camera calibration also allows us to determine the relationship between the camera's pixels and real world units (like millimeters or inches). For my calibration setup, I mounted my Pi Camera module in some helping hands, and pointed it directly at my monitor. We need the calibration pattern to be on a flat surface, and instead of printing and mounting it, I figured this was easier. All of the documentation I found stressed the importance of capturing multiple view points of the calibration patter, but I'll admit, I only used one view point for this demo and you'll see that in the code. I've tried other calibration techniques gathering multiple views as well, and I found putting the calibration image on a tablet was useful. The screen of the tablet is very flat, and the fact that image is emitted light, not reflected, makes the ambient lighting not matter. We'll start all of our files with a #! statement to denote what program to use to run our scripts. This is only important if you change the file to be executable. In this tutorial we will be explicitly telling Python to run the file, so this first line isn't particularly important. Another note about organization. I like to group my import statements by: included in Python, installed dependency, from statements included with Python (there are none in this case), from installed dependencies, and from created libraries. The charuco library is one I made to hold some values for me. Now let's look at the functions we've put together to help us here. This function allows us to easily use cv2 to show an image in full screen. There are several times while running this code where we will need to have a test pattern or image fill the available area. By naming our window we can find it later to destroy it. In Python, it's a good idea to add a docstring after the function declaration. This is just a string hanging out, but it's given some extra consideration. For example, if you document your code this way, the Python console can tell you information about a function by using the help command. Kill a named window, the default is the window named "Calibration"
Here's our function that destroys our full screen image once we're done with it. The important thing to notice is that the names must match when the full screen image is created and destroyed. This is handled here by our default parameter, window="Calibration". Here we have a helper function that takes an object that we pass in, and writes it into a JSON file for us. If you're new to Python, it's worth mentioning the context manger we use when writing to the file. The with open line above limits how long we have the file open in our script. We don't have to worry about closing the file after we're finished, as soon as we leave the scope of the with statement, the file is closed on our behalf. Here we do some setup. We'll be looking to make sure we have at least 50 marker points for our calibration. We also set the camera resolution, as well as start the camera thread. We insert the sleep to make sure the camera stream is warmed up and providing us data before we move on. Here is the last part of our setup. We make some lists to hold our discovered points, and set our frame offset. We don't really need to check every frame here, so it can help speed up our frame rate to only check every fifth frame. We also load in our charuco board. Charuco boards are a combination of aruco markers (think along the lines of QR code marker) and a chessboard pattern. With the combination of both technologies, it is actually possible to get sub pixel accuracy. You can find more information about the markers here. Here we start the main loop where we will do our work. We start by getting a frame from the Pi Camera module and converting it to grayscale. Once we have our grayscale image, we feed it into OpenCV's detector along with the original dictionary we used when creating the board. Each marker is encoded with an ID that allows us to identify it, and when combined with the board placement, it gives us accurate information even if the board is partially occluded. Let's continue with our original code. Next we check to see if we found any marker corners, and whether we've reached our fifth frame. If all is good, we do some processing on our detected corners, and make sure the results pass some data validation. Once everything checks out, we add the markers into the lists we set up outside of our loop. Lastly, we draw our detected marker on our camera image. Here we've added a check to see if the q key is pressed. If it is, we bail on the while loop. OpenCV is a little strange on how it wants to check keys, so we need to bitwise & the key value with 255 before we can compare it to the ordinal value of our key in question. At this point we have ether successfully found the points we need, or we've hit the q key. In both cases, we need to stop showing our full screen calibration image. From here, if we've collected the appropriate number of points, we need to try to calibrate the camera. This process can fail, so I've wrapped it in a try/except block to ensure we fail gracefully if that's the case. Again, we let OpenCV do the heavy lifting here. We feed our found data into their calibrator, and save the output. Once we have our camera properties, we make sure we can get the later, by saving them off as a JSON file. In this last section we leverage OpenCV to give us the new correction information we need from our camera calibration. This isn't exactly necessary for calibrating the camera, but as you see in the nested while loop, we are visualizing our corrected camera frame back on the screen. Once we've seen our image, we can exit by pressing the q key. Here's our main entry point. Again, if you're new to Python, this if __name__ == "__main__": statement might look a bit weird. When you run a Python file, Python will run EVERYTHING inside the file. Another way to think about this is if you want a file loaded, but no logic executed, all code has to live inside of a class, function, conditional, etc. This goes for imported files as well. What this statement does is make sure that this code only runs if it belongs to the file that was called from the command line. As you'll see later, we have code in this same block in some of our files, and it allows us to import from them without running as if we were on the command line. It lets us use the same file as a command line program and a library at the same time. Now let's take a look at what's in our imported charuco file. I've put up the relevant portions of the file here. There's a bit more that is used in another file where I was attempting an alternative approach, so you can just disregard that for now. As you can see, the file is mostly just constants and a little work to build our board and set up our parameters. One thing to notice here is our code does not live inside a class, function, or conditional. This code is run at import time, and before any of our main code is run! This way we can make sure all of our values are correct and available to us when we're ready to use them. The full working examples can be found in the GitHub repo as the aruco_calibration.py and charuco.py files. Now that we have found the contours of our project-able region, we can work on de-skewing the image, or calculating and applying the perspective transform we need to take this trapezoidal region and making it square. This artifacting is introduced by the fact that we cannot have the camera and projector directly on axis with each other. We need to do this correction so that we can accurately place the image sprites in the real world. The code to do this now that we have all our information is fairly straightforward. This accomplishes our de-skew, and crops our image to the region in question. Another way to think of what this does is that it gives us back only the part of our image that is our project-able region. Everything else is discarded. This is important because we will need to look for faces within this region, and now that the region is square (not trapezoidal) we can start to calculate where our sprites need to go. Now that we've figured out how to map between our two spaces, we can finally create our new image! We will start from a blank black image, and merge our sprite image on top. We want to avoid projecting what the camera sees back on top of the real world thing it saw, so effectively a black image is no projection. Interesting note here, if you are in an environment that has poor lighting and you run into issues with the camera seeing and detecting faces, you can change the black background to varying shades of gray to have the projector create its own lighting. You add utility at the expense of making the project-able region more pronounced. Let's run through the complete code for our project. In addition to our normal imports, you'll notice that I'm reaching back into our calibration file to reuse the load_camera_props, undistory_image, get_perspective_transfom, and show_full_frame functions. No need to copy and paste. # Grab some info from the detected face. Here is where we build the full image we will project back onto our detected face. We start by unpacking the display and frame resolutions into their widths and heights. Next we create our blank image. We use the np.zeros function to create an array with three channels (RGB) and all values set to zero for black. Our next step is to step through all of our detected faces. In our loop, we use the dlib predictor to find our key facial points and convert them to a numpy array. We need to gather some information about our found faces, so we pull the parameters from our face object, mark in the code above. We also perform our space mapping here, so that our locations and values are already in our display resolution. In the next few lines, we make a copy of our facial features array, and transform each of the points to our display space. If you'd like to see where each of the points lands, uncommenting the cv2.circle command will draw little circles on each of the points. This can be useful to visualize where each of the points is in relation to our detected face. I used this to verify that we were accurately displaying our image on top of a real face. In the last few steps, we calculate face tilt by looking at our detected face's eyebrows. Once we've found the angle, we apply our sprite to our black image and hand it back to the calling function. One interesting thing of note: we don't need to save the result of apply_sprite(). Everything in Python is pass-by reference, so when we make modifications to img inside the function, we are modifying the same object img that exists in this scope. Applying the sprite to our base image is fairly straightforward, with a few special pieces to consider. We start by reading our image from file. There is a lot of overhead with this, and if I were to do a second version of this code, I think I would make a class where I could store the loaded image and skip reloading it each frame. Once we have our sprite image, we rotate it in relation to head tilt, and the scale and move our sprite to the correct location. Once we know where the sprite will be positioned in the final image, we need to crop it to the bounds of the image we will project back onto our face later. We do this with the series of if statements. Lastly, we loop through our channels (RGB), and use the sprite's alpha values to overlay the images, pixel by pixel. Remember that the range(3) function will return a list from 0-2 inclusive, or [0, 1, 2] for three total values. When we use sprite channel 3, we're accessing the alpha value. This is why we need to load the image with cv2.IMREAD_UNCHANGED to preserve this data. As a note, when we use the backslash \, we are breaking a single line onto multiple lines. If you don't use this, Python will give you a syntax error. In this function, we scale our sprite to match the size of our detected face. Our first parameter, manual_adjust, I added after the fact because we want our sprite to extend a little on both sides of the detected face. It looked a bit weird with the sprite exactly the same with as the face. There are situations where it would be desired to have this be the case, but I found that using a hat wasn't one of them. After setting our manual scaling factor, we pull size information from our loaded sprite, and compute our scaling ratio. We use OpenCV to scale our sprite, providing the ratios we calculated. Next we look at y_origin, or the placement of our sprite. Remember that y=0 is located at the top of our screen, and positive y values go down our view area. We subtract the height of our scaled sprite from our y placement to see if it's negative (off the top of the page). If it is, we cut off the top of our sprite, and reset the calculated y_origin value to be 0 or the top of the image. Finally we return the sprite and its calculated placement in the final image. Here we just calculate the angle between two points. In our use case, this angle should be head tilt computed from the location of the eyebrows. Here we set up what options we can provide from the command line, and their defaults if no option is provided. This helps us be more flexible with our program, avoiding the need to make code changes for each use case. 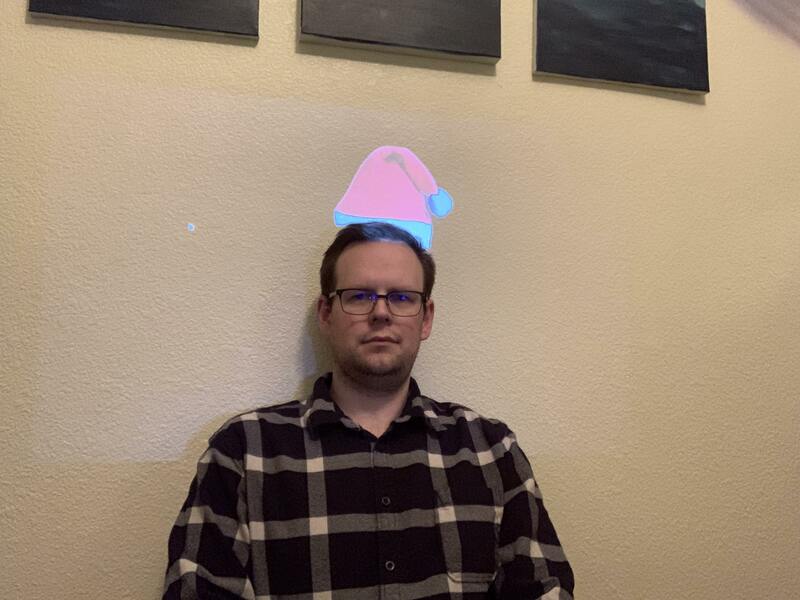 One thing to point out – I've set the default for my sprite file to be 'santa_hat.png'. You could use any image file here, but the thing that makes a good file is a transparent background. We finally get to put the whole thing together! When we kick off this script from the command line, we start by pulling together all of the arguments provided and their defaults. We provide some messaging to the user giving some status indication, and load our facial detector and predictor from dlib. Next, we grab the resolution for our camera from the arguments, and create our video stream. Since the stream is running in a separate thread, we sleep to make sure it has time to start before we try to get data from it. We load our camera calibration properties from file, and gather our display resolution. In the next line, we find our projection region and the transforms we need to correct the frames that we capture. At this point, our setup has finished, and we can begin processing frames and building our projection image! We step into a while True: loop to continue processing images until we press the q key. In our loop, we get a frame from our video stream and remove its camera distortion. After that, we undistort our frame, and crop it down to our region of interest (only the area that we can project onto). From this point, we get a grayscale copy of the image, and pass it to our face detector. We pass the returned faces into our image builder along with our cropped image, the display resolution, and our trained predictor (provided by dlib), and get back the image we need to project or display on our monitor. Now that we have our image, we need to display it. We use our show_full_frame() function to do that for us. The next line, key = cv2.waitKey(1) & 0xFF allows OpenCV to update the projected image on the screen, as well as look for any pressed key. If a key has been pressed, and the key is q, then we break out of our while loop, clean up our windows and exit the program! My hope is that you see something close to what I have here. Oh, I didn't mention it before, but since we loop through our found faces, nothing says this is limited to one face at a time! 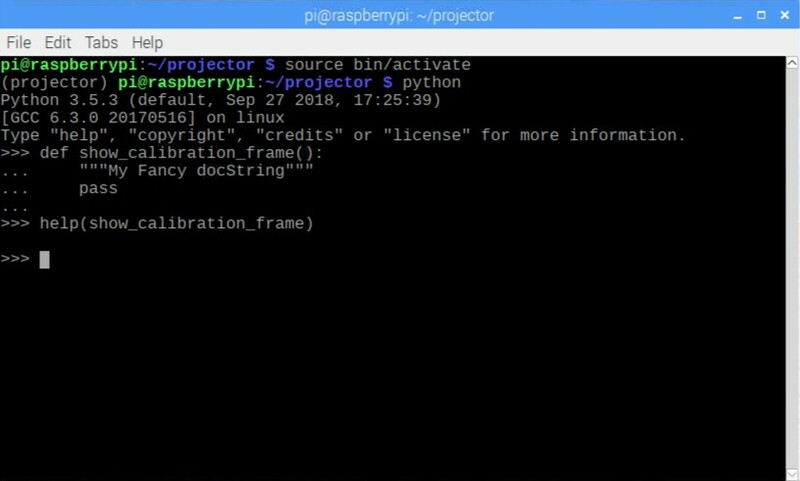 My hope is that you found this tutorial informative and helpful in understanding some of what you can do with computer vision on a Raspberry Pi. If you have any questions or need any clarifications, please comment, and I'll try to clarify where I can. Want to learn more about Python? Hvae a look at some of the resources below!